Afegbua, according to Punch Newspaper said he stood by the statement, insisting that he sat with the former dictator before he issued the statement. He said as one who had been doing the job for over 14 years, he could not issue such a statement without the permission of his principal. The spokesman said it was some overzealous people around Babangida that issued the rebuttal. In an earlier statement titled, ‘Towards a National Rebirth’ and signed by the Media Adviser to the former dictator, Prince Kassim Afegbua, Babangida advised Nigerians to do away with analogue leaders and embrace those of the digital age. In the statement, Babangida was quoted as saying that while Buhari reserved the right to seek re-election in 2019, the time had come for Nigerians to unite behind a younger candidate. The statement read in part, “In the fullness of our present realities, we need to cooperate with President Muhammadu Buhari to complete his term of office on May 29, 2019 and collectively prepare the way for new generation leaders to assume the mantle of leadership of the country. “While offering this advice, I speak as a stakeholder, former President, concerned Nigerian and a patriot who desires to see new paradigms in our shared commitment to get this country running. “While saying this also, I do not intend to deny President Buhari his inalienable right to vote and be voted for, but there comes a time in the life of a nation, when personal ambition should not override national interest. According to the statement, Babangida said the All Progressives Congress had failed to honour its many campaign promises. He maintained that restructuring, especially devolution of powers, was the best way to address the myriad of problems plaguing the nation. The ex-military ruler, however, advised political parties not to use the issue of restructuring to hoodwink voters ahead of the 2019 elections. The statement added, “When the ruling party campaigned with the change mantra, I had thought they would device new methods, provoke new initiatives and proffer new ways to addressing some of our developmental problems. “By now, in line with her manifesto, one would have thought that the APC would give a fillip to the idea of devolution of powers and tinker with processes that would strengthen and reform the various sectors of the economy. “Like I did state in my previous statement late last year, devolution of power or restructuring is an idea whose time has come if we must be honest with ourselves. We need to critically address the issue and take informed positions based on the expectations of the people on how to make the union work better. The former dictator, who ruled from 1985 to 1993, was also quoted as asking the Federal Government to encourage herdsmen to set up ranches instead of encroaching on farmlands. The statement said Babangida expressed shock over the killings in some states especially Benue, which he described as a pogrom. It added, “In Dansadau in Zamfara State recently, North-West of Nigeria, over 200 souls were wasted for no justifiable reason. The pogrom in Benue State has left me wondering if truly this is the same country some of us fought to keep together. However, in a statement issued hours later in Minna, the former dictator said the earlier statement was Afegbua’s personal opinion. 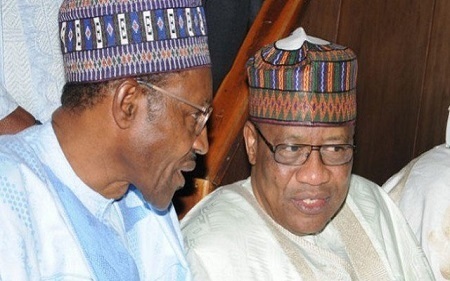 Babangida, who annulled the June 12 presidential election in 1993, said he had unfettered access to Buhari and could therefore meet him in person without resorting to open letters. The former dictator, however, expressed worry over the state of the nation, adding that there was a need for Nigerians to embrace unity. He said as democracy continues to grow in Nigeria, the country would do well by returning to the two-party system as this would ensure a more effective system. He called on Nigerians to embrace unity as this was the surest way to ensure progress. Babangida said that he believed that all issues in a democratic atmosphere should be sincerely discussed and resolved in the spirit of give and take. “Since after my military years that metamorphosed to the only military President in the history of Nigeria and my civilian life, I always have one clear objective that freedom can only be achieved through democracy,” Babangida said. According to him, the clamour for re-alignment of governance in the country as we are approaching 2019 election year is a welcome development. But Afegbua, however, said the former dictator had not withdrawn his statement. He said this during an interview on a Channels Television programme tagged ‘Politics Today,’ on Sunday evening. Afegbua added, “I have been doing this job for 14 years now and I have never issued a statement on behalf of former President Babangida and get a rebuttal. I extracted commitment from him and authorisation before I issued the statement and it was in process but of course you know, IBB is for everyone and so people want to love him more than he loves himself. “When the statement was sent and some of his friends saw the twist of the reportage on the social media and how they sensationalised it and all of that, taking away the kernel of the content of the statement, they felt that we were just trying to put the former President on a collision course with the present President and so to that extent, they went to write a statement to deny that but I have since spoken to him. Afegbua said Babangida was calling for the emergence of a young President in 2019. When asked if the former ruler would be supporting a third force, Afegbua said Babangida would support any credible young candidate. He added, “From the statement you could easily deduce that General Babangida wants a new set of leaders from the younger generation of Nigerians who in his view have the resourcefulness and the capacity to manage governmental affairs.